I'm a divorced mom of 3 gluten-free daughters. We've outgrown dairy, soy, egg, and corn allergies, but still deal with a berry allergy in my youngest. Why spend $4 on a 2 ounce jar of pumpkin pie spice? Mix up your own for less, and be certain there are no hidden fillers or allergens. This is a delicious gluten free, family-friendly recipe! It can also be (if you double check ingredients!) a wheat free, dairy free, soy free, egg free, tree nut free, peanut free, fish free, shellfish free, corn free, top 8 allergen free, and vegan/vegetarian recipe. Combine all of the above into a small bowl and whisk together until well blended. Once it is well combined store in a spice jar or another lidded container. This makes a little under 3/4 cup. You can halve the recipe easily, but I prefer to make a larger batch so I have to make it less often. 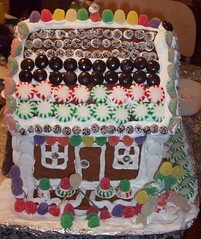 This year was our first year making a gluten-free gingerbread house. It’s one of those things I had always intended to do, but never quite gotten around to doing. This year we had a collaborative effort – I made the gluten-free gingerbread cookie batter, my mother cut out pieces according to a template and made the frosting “glue”, then my three daughters decorated. My daughters are now able to have dairy, which meant we had more variety available for our decorations, but there are a lot of gluten-free and dairy-free candies that make great decorations – gumdrops, sour watermelons, and mints were some of the favorites here. Candy canes would’ve been a good addition, too. 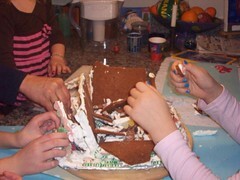 The best part, though, is that the gluten-free gingerbread cookie recipe makes delicious cookies, so after we smashed the house for the New Year, we all dove in and started munching on the pieces of house. Yum! 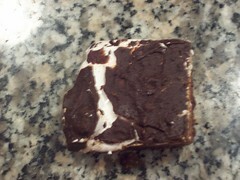 My daughter heard that her friend’s mom made brownies with fluff on top, and had to have them right away. We came up with this recipe, which is delicious. When we told her friend about it, it turned out that my daughter had misunderstood, and her friend’s mom doesn’t make these, so it’s now our special recipe. They are gooey and good, but they need to stay chilled or they get very, very sticky! This is a delicious gfcf, gluten free, family-friendly recipe! It is also (if you double check ingredients!) a wheat free, dairy free, soy free, tree nut free, peanut free, fish free, and shellfish free recipe. Unfortunately, my brownie recipe doesn’t work well without eggs, so this is not vegan or egg-free. 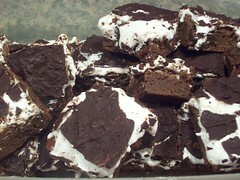 Spread Marshmallow Fluff over cooled brownies, making an even layer. Mix together margarine and chocolate chips in a bowl, then microwave in 60 second intervals, stirring until well combined. 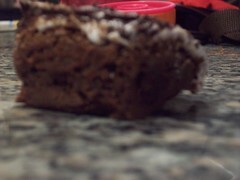 Pour chocolate mixture over fluff, and spread with a spatula until you have an even layer of chocolate. Place the entire pan into the refrigerator for at least an hour to chill. Slice into 1 1/2 inch squares. Serve chilled. If you miss the flavor of raspberries and blackberries but cannot eat them, consider trying gooseberries – they are their own food family (related only to currants) and are unlikely to cross-react with other foods. The green gooseberries taste very similar to raspberries and blackberries when eaten raw. However, the red gooseberries are quite tart, and need another use. This syrup is great over pancakes, waffles, or ice cream, and has a wonderful sweet-tart flavor. Plus, it’s incredibly easy! This is a delicious gfcf, gluten free, family-friendly recipe! It is also (if you double check ingredients!) a wheat free, dairy free, soy free, egg free, tree nut free, peanut free, fish free, shellfish free, corn free, top 8 allergen free, and vegan/vegetarian recipe. Combine sugar and water in a small pan over medium heat. Whisk and cook until the sugar fully dissolves. Meanwhile pull off the little brown or green bits at either end of the gooseberries. Cut gooseberries in half. Add gooseberries to the sugar/water mixture. Let cook over low heat for 1-2 hours, stirring occasionally. 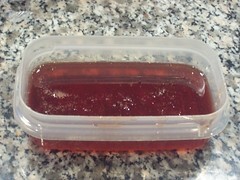 Strain the seeds and fibers from the syrup, and pour into a refrigerator and microwave safe container. 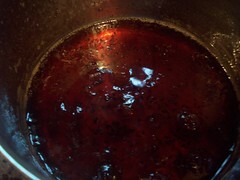 Refrigerate syrup, then warm for a few seconds in the microwave before serving over waffles, or ice cream. This is a wonderfully easy treat tip for those of you who like chocolate-mint! This reminds me of the Mint Chocolate Brownies I remember from volunteering at the nearby folk music coffeehouse as a teenager. Allergy note: my brownie recipe contains eggs, but is gfcf, gluten free, and dairy free. Junior Mints have soy in the ingredients, and a “may contain” warning for dairy and egg. We have a dairy intolerance rather than allergy, so we have been Ok eating foods that “may contain” dairy, and have had no issues with Junior Mints. However, contact the manufacturer yourself before you introduce Junior Mints! First, make a batch of Super Easy Brownies. Once the brownies are done, shake a regular sized box of Junior Mints over the brownies, then gently press them into the cooked brownies. Place the pan of brownies back in the oven for 5 minutes. 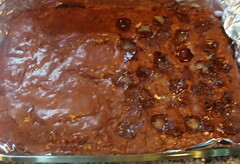 Remove from oven, and use a spatula or butter knife to spread the Junior Mints over the brownies. Gooey minty goodness, and so, so easy! This also works fine over half the brownies, if you want to keep some of them uncontaminated for those of us who don’t like mint. Variation: Try this with other chocolate-based candies, you may end up with a new favorite flavor combination! Everyone has influences on their cooking. One of my biggest influences is my Nana, who taught me how to make ravioli and many other things. Don’t forget to write down notes and recipes from your biggest influences, as you never know what the next day will bring. I have come to stay with my grandmother and her husband to help them as she starts recovering from her stroke. Her prognosis looks good, but every difference between “before” and “after” is difficult. They need love, meals, some help here and there (especially with the stairs) and someone under 80 driving to run a few errands. Being here feels very right. My heart is full, and I look forward to filling their fridge and freezer in return. Internet connectivity is spotty, as is email, but I’ll be back on Monday with book reviews, reviews of some new Gluten-Free/Dairy-Free products, recipes, a review of a Solar Science lab, and more random musings. Go hug your grandmothers, and jot down their recipes. My oldest daughter is carrying on the tradition of good food in the family by making my grandmother’s cole slaw recipe for dinner with her grandmother. Our family has Celiac Disease, an intolerance to dairy, and LG has a severe berry allergy. We bring our own food to birthday parties, parks, and playdates, but I never wanted the dietary restrictions to restrict the girls’ access to activities. Occasionally an event is so food-centered that we can’t participate, but as food restrictions become more well-known, we can go to more and more events without risking a reaction. Are you getting ready for the holidays? First, an apology – we’ve had some site-wide downtime and snafus when we needed to switch web hosts this weekend. We are sorry for any inconvenience, and will be posting extra recipes this week to make up for it. The Food Allergy Carnival was posted Friday. Over at A Gaggle of Girls, we contributed a piece about planning in advance for the holiday. Meanwhile, there’s about a month before Passover. Are you stocking up? Remember that many foods that are “kfp” or Kosher for Passover are also safe for a wide variety of allergens. During Passover, most Jews avoid wheat, soy, and corn, in addition to leavening, though some food has matzoh. You want to look for Kosher for Passover labeling (get your corn-free Coke!) and the words “non-gebrokts”, which means there is no matzoh. Today, I posted an article about raising allergy-friendly kids, and the incredibly easy kids-cooking Revolutionary Pumpkin Custard. There are some other great recipes including Vegan Chocolate Cake, which we make gluten-free and vegan, calling it Wacky Cake. I’m glad to see there are other allergy-friendly recipes there! If you were going to read articles on healthy and allergy-friendly living, what kind of articles would you like to see? Last week I had the opportunity to review a new juice called Froose. It’s a mix of whole grain brown rice and juice, and is gluten-free, kosher pareve, dairy-free, soy-free, and sweetened with brown rice syrup instead of corn syrup or sugar. Please check out our review and check out Froose for yourself. We really like the peach! We were also lucky enough to receive a sample of some new gluten-free and dairy-free treats from Amy’s Kitchen! They sent us my favorite enchiladas, plus the new gluten & dairy-free pizza, ziti, cream-of-rice. Yum! They’ve added a delicious-sounding tamale, and a ziti kid’s meal to their product line, too. Check out the labeling at Amy’s Kitchen – it’s really easy to see what items will fit with your dietary restrictions. I haven’t seen my kids looking forward to lunch this much for a while! However, I doubt that when Amy’s Kitchen created their vegan and gluten-free pizza they intended for kids to dream of adding meat-filled pepperoni! Copyright © 2013 Rachel's Recipe Box. All Rights Reserved.